The Aladdin Company of Bay City, Michigan was a competitor of Sears in the mail-order house business. The founders of the company, brothers Otto and William Sovereign, planned a city in Florida in which every house would be manufactured by Aladdin. It would bear the name Aladdin City. The Sovereigns and some other investors created The Aladdin City Sales Company in 1925 and purchased a large parcel of land located 20 miles south of Miami. And they began to build the Moorish-themed city in December of that year. Cover of the sales brochure for Aladdin City. Scan courtesy of the Clarke Historical Library of Central Michigan University. The sales brochure announced: "Because the inspiration for its name is derived from the wonderful Oriental story of Aladdin and because location, surroundings, climate, and vegetation so peculiarly fit it, the Persian style has been selected for the motif of Aladdin City." The center of city was Ali Baba Circle. Inside the circle was to be Ali Baba Park, with a large pool in the middle. Ali Cogia Circle surrounded Ali Baba Circle, and those circles would constitute the city's commercial district. Other streets in the city were named Sovereign Boulevard, Aladdin Boulevard, Damascus Street, Cairo Street, Hassan Street, Mustapha Avenue, Bagdad (sp.) Street, Sinbad Street, Cathay Street, Sahib Street, and Mecca Avenue. Can you imagine an American developer today using those street names? The plat for half of Aladdin City. 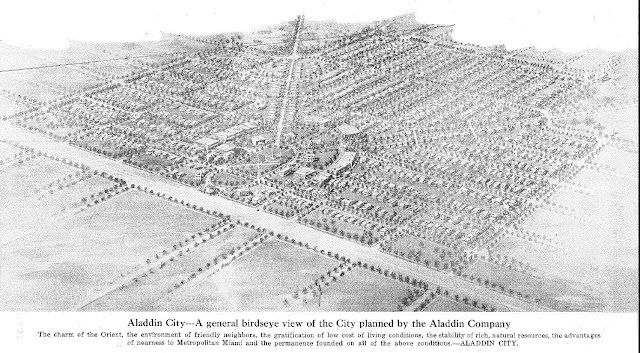 They planned to build a plant at Aladdin City that would manufacture the ready-cut houses for the estimated 10,000 people that would live in the city. 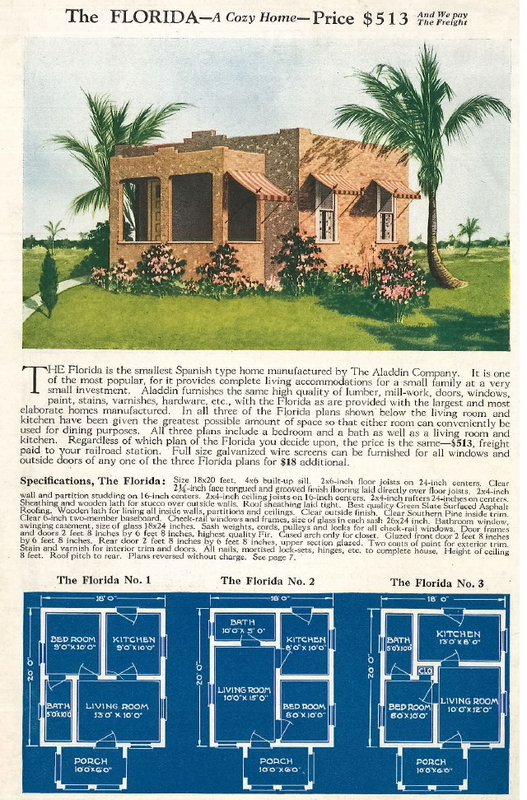 Then the plant would be used to build houses for the Florida market, the West Indies, and South America. Advertising stated that: "Aladdin City is NOT a suburb--NOT a subdivision. It is a complete self-sustained city in the heart of the great Redland agricultural district--and with an INDUSTRIAL PAYROLL back of it." 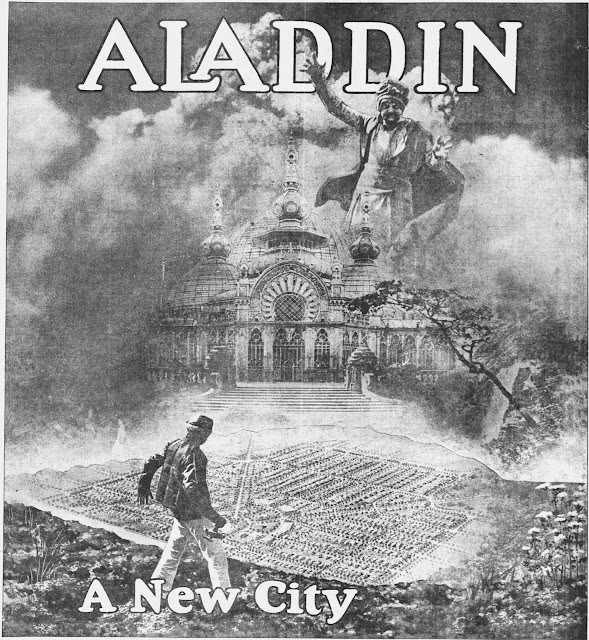 Illustration of Aladdin City from the sales brochure. This was a big project! Scan courtesy of the Clarke Historical Library. These models were some of the highest priced homes Aladdin sold. Aladdin offered these models for sale nationwide, not just in Aladdin City. The materials for the Aladdin City houses were shipped from Aladdin's plant in Wilmington, NC. 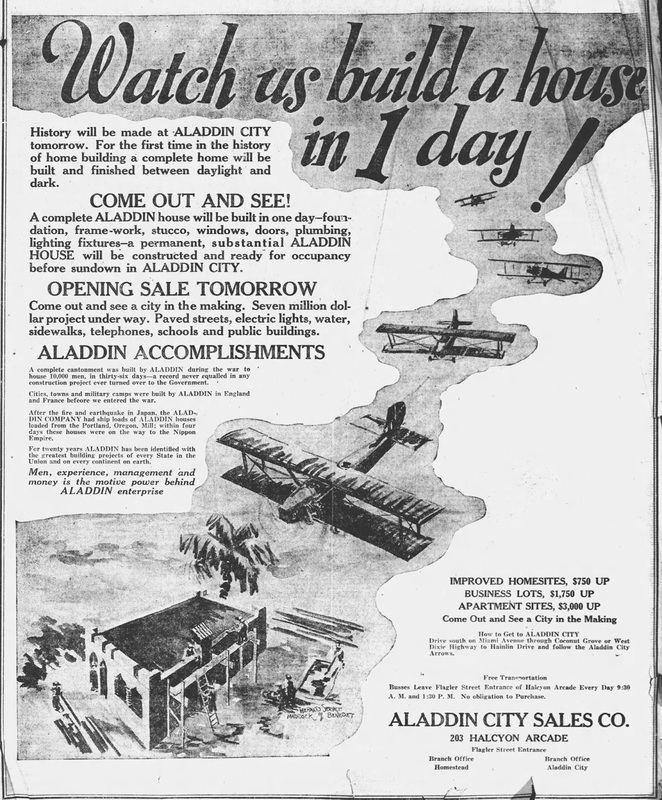 On opening day, January 14, 1926, Aladdin built a "dawn-to-dusk" house. The company chartered six airplanes to bring in building materials from Fort Lauderdale. Hundreds of spectators witnessed 21 carpenters, plasters, electricians, plumbers, and cement workers put up the house, complete with landscaping. A local school let students out early so that they could watch too. A press release from Aladdin stated: "In the morning the sun rose on a vacant lot and by nightfall a house had been carried in sections by airplane, fitted up and completely furnished so a family was able to move in." 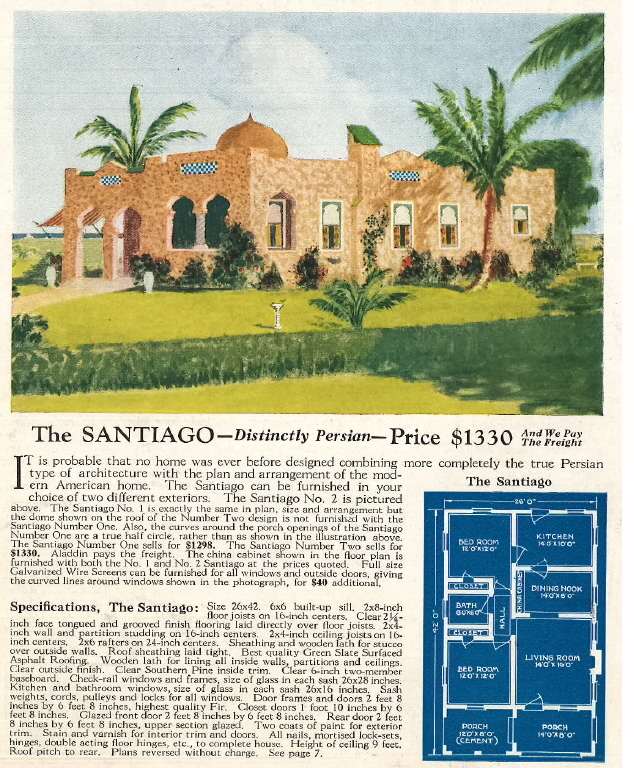 The Santiago model was shown in the ad, but I'm not certain that's what was actually built. Ad from the Miami News. 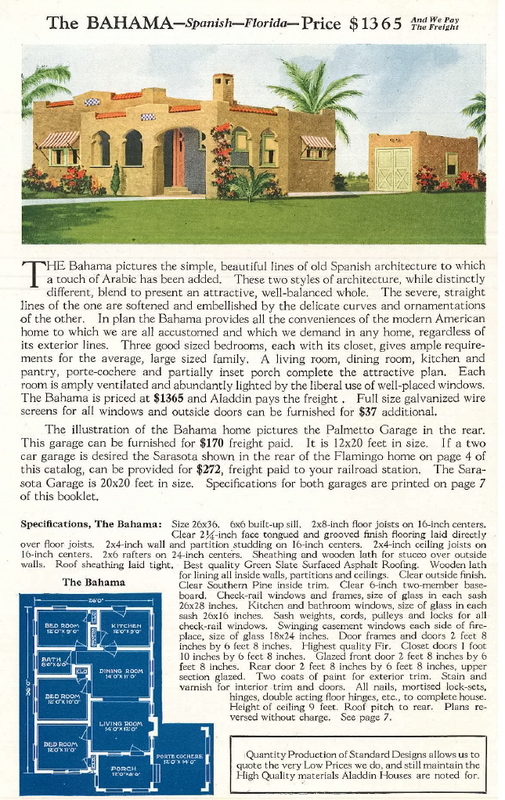 An advertisement in the Miami News announced that 874 home sites had been sold on opening day. $250 down would buy the home site (total cost $1000) and Aladdin would "aid you in planning your home, build it for you, and help fyou finance the entire transaction...."
A later advertisement in April 1926 invited people to "See a city unfolding before your eyes! Giant road crushers making beautiful 100-foot boulevards. A wonderful swimming pool and sunken gardens being created. Homes being rushed to completion. Business blocks being built." Things appeared to be moving forward. The Sovereign brothers' timing could not have been worse. Aladdin City was doomed due to factors outside their control. First, there were logistical problems. 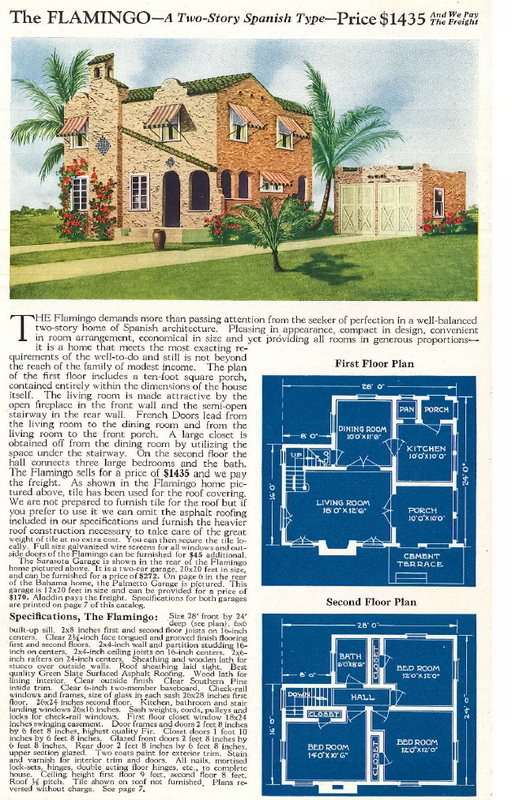 Florida, and particularly the Miami area, was in the middle of a housing boom in 1925. The railroads found that they could not handle the volume of freight due to the massive amounts of building materials being ordered. Trains took almost a week to get from Jacksonville to Miami because of the traffic, and when they reached their destination, there were already more than a thousand freight cars waiting to be unloaded. Consequently, the largest three railroads were forced to place an embargo on imperishable freight to ensure food, fuel, and perishables (like ice!) could be delivered. The lack of available building materials greatly slowed the initial progress of Aladdin City. 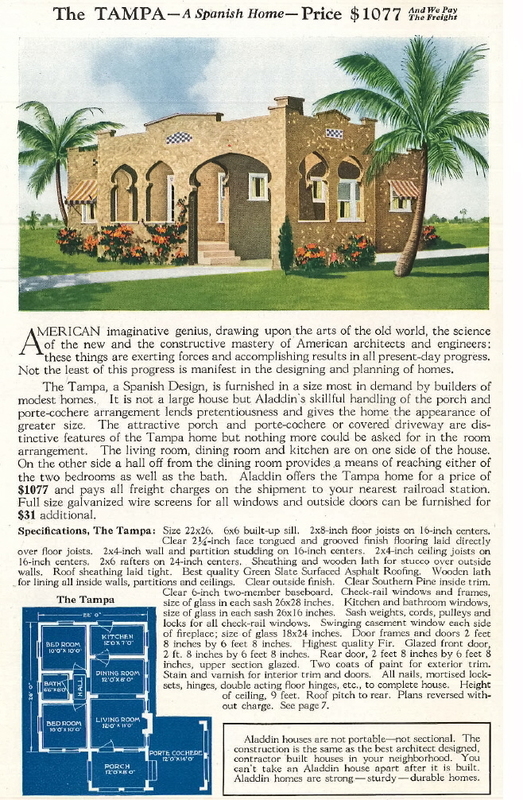 "Long delayed arrival of machinery and equipment for developments has interfered with our progress schedule....come and see the ten Spanish bungalows now under construction" said an ad from February 1926. The final blow to Aladdin City was the real estate bubble in Florida. In the early 1920's people across the United States began to see the Miami area as a tropical paradise. Property prices rose rapidly on speculation since credit was easy to obtain. City lots in Miami were bought and sold as many as ten times in a single day! Otto Sovereign wrote in his autobiography, Fifty Million Dollars on a Shoestring, "I observed Aladdin City emerge from a raw forest with an urgency born of fear that the boom would be over before the lot selling campaign got underway." By the summer of 1926, there were no more buyers for the overpriced land and properties, and prices began to come down. Investors started selling their properties to lock in their profits. Then panic selling ensued as there were few buyers, and the real estate market crashed. Investors went bankrupt under their crushing debt loads. The Aladdin City development suffered. By mid-1926 no one was buying real estate. 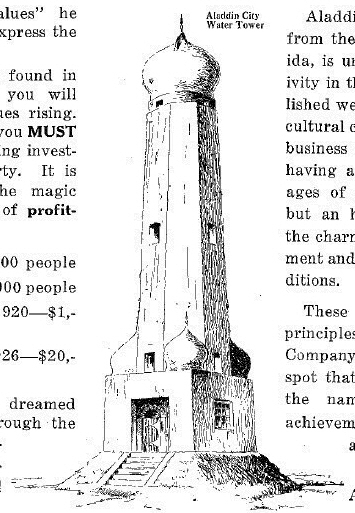 There was no mention of Aladdin City in the local newspapers and no advertising after spring of 1926. The Aladdin City Sales Co. was in receivership by August of 1926. The Aladdin City Sales Co. was finally dissolved in November 1936. Through 1939 the Sovereigns continued to liquidate their land holdings at a major loss. The streets were laid, sidewalks built, and street lamps installed. In 1926, the Seaboard Air Line Railway built a train station in the new city. 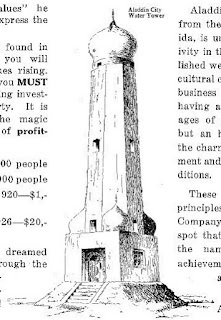 The planned water tower for Aladdin City. There's no evidence to show that this was ever built. Scan courtesy of the Clarke Historical Library. People lived in Aladdin City through the 1930's. In 1936, the empty train station was leased and used as a potato packing house. Aladdin City died a slow death. One of the Aladdin houses was moved to nearby Goulds. By 1960 almost everyone had moved out. A man stands in front of an abandoned house in 1960. This looks like the side of the Santiago model (see below). This 1960 photo was captioned: "E.A. Frasier stands in front of his house that was built in a day." The abandoned train station in 1960. Soon afterward, the station was destroyed by a hurricane. "There is the extravagant talk, once again, of building whole new 'cities'. (For a 1920's version of a 'city' that was to be, consider a place called Aladdin City in South Dade County which consists of a single shack with, behind it, streets and sidewalks running through the woods.)" In 1992, Hurricane Andrew, a Category 5 hurricane with 165 mph winds, destroyed all remaining structures in Aladdin City. Much of the land originally platted by the Sovereigns is now used for farming. Some of the streets are still there, and most have been renamed. Aladdin City today. Photo courtesy of Wikipedia. Aladdin City is largely forgotten and information is scarce. If you have old photos or anything else to share, please email me. I'd love to hear from you. A reader named Jack miraculously located the Aladdin house that was moved to unincorporated Miami-Dade County sometime before 1960. Based on Google Streetview, it appears to be a Bahama model. 22215 SW 124th Ave. Goulds, FL. The house has a distinctive crenellated roofline. The porch has been partially enclosed. Image from Google Streetview. You can see the front door from this angle and the original arches on the sides which haven't morphed into rectangular windows. Image from Google Streetview. 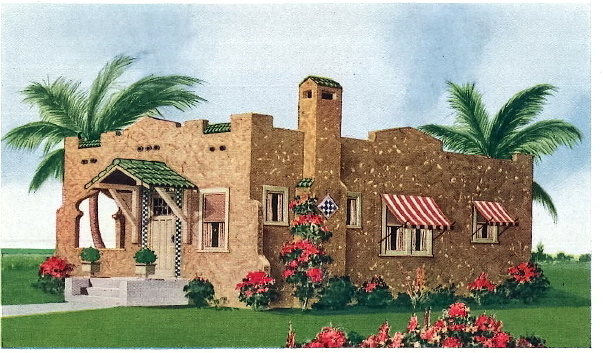 This Moorish Revival house was built in 1926 according to the county, which is the exact year the Aladdin City houses were constructed. The county believes it is being used as a church, which is interesting because it has no parking and no signage (and no windows). 22295 SW 124th Ave. Goulds, FL. Could it be? I know it's missing a fireplace, but maybe in South Florida the owners thought they didn't need one! Check out that unique roofline. Image from Google Streetview. Feel free to post your thoughts in the Comments below. Video of the dedication of Aladdin City has been posted on YouTube (first 49 seconds). The footage is housed at the Wolfson Archives of Miami Dade University. What an amazing story, Lara! Thanks for the nice words! I'm really hoping someone comes through with some photos. I'd love to see what was built. This is a GREAT post, and just the background info I was looking for. Thanks for including the floor plans; I love those. Hi, Lee Ann! The Clarke does not have the brochure online. The vast majority of their materials are not online, unfortunately. The photos were old press photos from a Miami Herald article written in the 1960's. That's all I could find. I have not been able to dig up the text of the article, but I was trying to find someone in the Miami area who could get it. The problem is that I don't have a precise date. Could you post the whole brochure? Does it have plans for commercial buildings in it? Hi, Jim! It's not my brochure so I don't have permission to post the whole thing in its entirety. There were no details on commercial buildings. 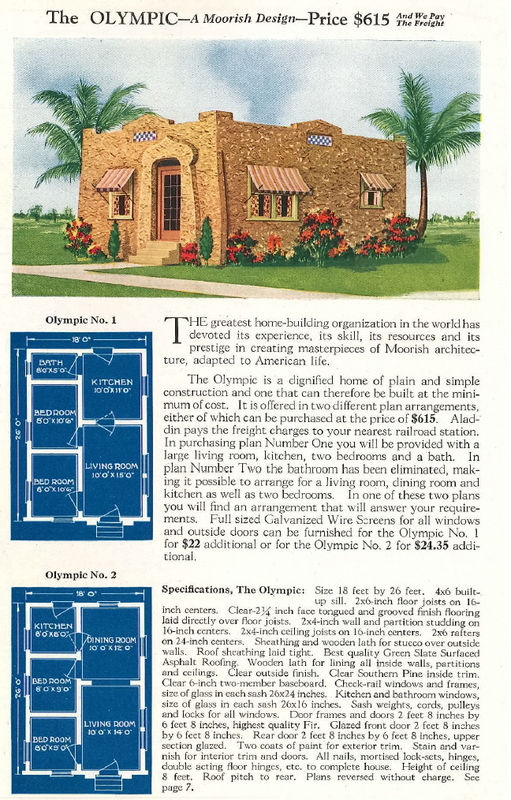 It was a pre-sales brochure for prospective homebuyers. Hi, Brenda! So glad to hear from you. So you're *right there*! Can you please email me at lara@sears-homes.com? I would like to hear more about your teacher's son and where I might reach him. I'm looking for photos of the houses from back in the day. Thanks! Hi, Kevin! 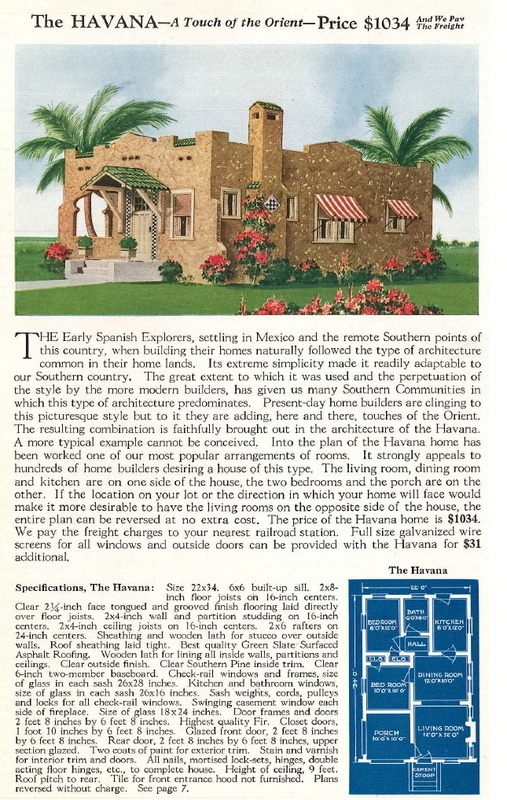 The brochure about the houses was copyright 1926. That ad certainly grabs your attention! Hello, I moved to one of the houses here in Aladdin City about 4 years ago and this was very interesting to read. The last picture that was courtesy to Wikipedia, my family and I go there everyday to check the mail. I never knew that this small area that I live in held so many dreams and potential. HI, Katherine! If you see anything interesting to photograph, please send it my way. Thanks for your note.